"Before vehicles drove the ALCAN, before airplanes landed at the Ted Stevens International Airport, and before communications went wireless on the World Wide Web, only the sea connected Alaska with the known world. 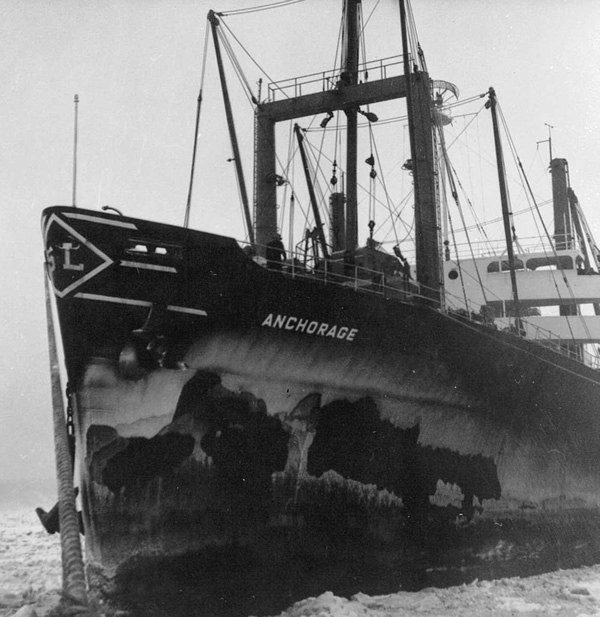 Alaska's history can be told through the stories of the vessels that shipped the people and goods from around the world to carve out the modern State of Alaska from the Last Frontier. Bounded by the seas on 33,000 miles of coast land, the history of Alaska from the rain forested Pacific Southeast to the storm wracked Bering Sea and the ice-bound Arctic Coast, is best seen through the salty spray from the rolling deck of a ship..."
SeaCat Explorations is an experienced Alaska-based company researching and writing on topics related to Alaska maritime history. My aim is to provide you with a clear understanding of the historical records located in Alaska archives and repositories. As the primary researcher, I am an independent scholar and writer with over thirty-three delightful years in Alaskan waters. My professional career as a journalist, non-fiction writer and editor laid a strong keel of Alaska's unique sources of historical knowledge, research skills, and experience in maritime historical maritime topics. With connections to historical societies, museums, libraries, state and federal government repositories, and private collections around the state I am positioned to find the information you need. I assist individuals and groups with timely and cost-effective research explorations into historic Alaska maritime materials. 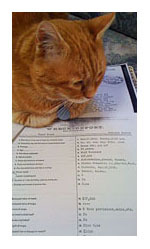 In these efforts I am ably assisted by the cat SeaLegs. About 70% of Alaska historical collections are now listed online. Often, however, what the researcher finds is a brief reference from the 'finding aid' rather than the detail of the historical record. Many photographic collections have only a representative showing on the internet due to the volume available. In many instances, the actual copy of letters, invoices, manifests, deeds, property descriptions, log books and ships articles are not posted but only referenced. Almost all Alaska newspapers from the past two centuries have been preserved: on migraine-inducing microfilm. The clinching detail of historical ephemera so fondly touted by the History Detectives really resides in bits and pieces in the worn manila folders of the Vertical File, not online. These are the times you need a warm body, with cotton gloves, a magnifying glass, a laptop computer and access to the physical archives. That's where I come on deck. From researching commercial and customs transaction records, the reports of the territorial governors, and identifying the registry of vessels that shipped ice out of Kodiak in the 1850s, I have a good grasp on the locations of Alaska's maritime documentary evidence. For corporate and business clients I research—and conduct in-person interviews with principals and employees—and write official histories or biographies. Factual company history enables shareholders and management to plot a straight forward policy course plus bolster compelling fundraising or marketing campaigns. I love Alaska. I especially love the maritime life. But most of all, I love The Quest. When you need historical documentation from archival repositories in Alaska on maritime topics, we're the curious cats you want aboard! Alaska's port of necessity. The anchorage at the mouth of Ship Creek that turned into a port that built the city. 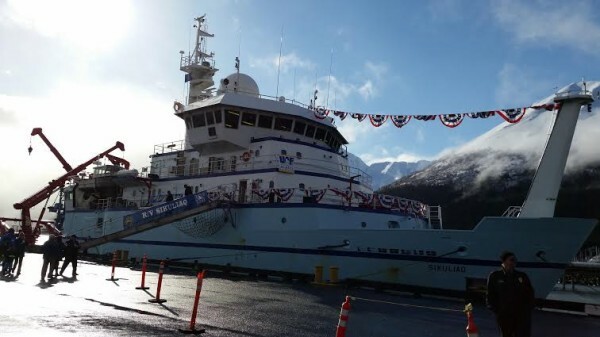 The long awaited state-of-the-art research vessel R/V SIKULIAQ was commissioned in Seward. 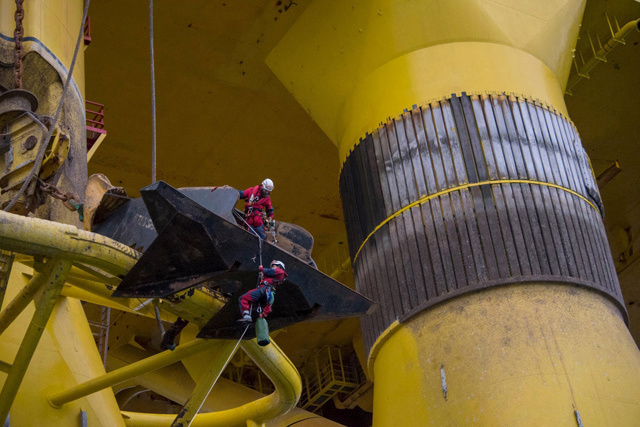 Royal Dutch Shell Plc said it has filed a complaint in federal court in Alaska seeking an order to remove Greenpeace activists who climbed aboard an oil rig in the Pacific Ocean bound for the Arctic on Monday in a protest against Arctic drilling. 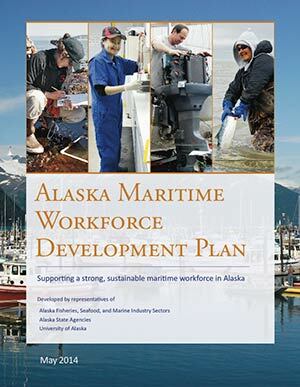 Maritime companies, the University of Alaska, state agencies and educators have put together a plan to get Alaskans into the 'hawse pipe' for good paying jobs in the industry. The Rubber Duck knows no frontiers, it doesn't discriminate people and doesn't have a political connotation. The friendly inflatable has been described as having healing properties, and in nearly eight years of world travel, it’s been everything it was quacked up to be. 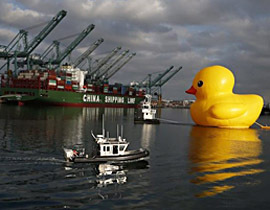 Most recently, The Rubber Duck was on hand at the port of Los Angeles for the tall ships festival. Anyone want to see the Duck in Cook Inlet?? Years after the event, NOAA finally crafts a logo and has a page of information on marine debris from the 2011 Japanese tsunami. Ironically, it links right back to Alaska's DEC page for the latest on Alaska sightings of the toxic mess. 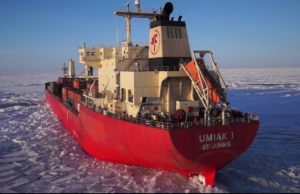 On a recent trip, the MV Umiak I, a 31,992 DWT ice-strengthened cargo ship, used a variety of video-equipped UAVs (Unmanned Air Vehicles) to scout ahead of the vessel in the ice-covered waters off Canada’s northeastern Labrador Coast to provide detailed real-time visual information about local ice conditions. Read the article at gCaptain here. 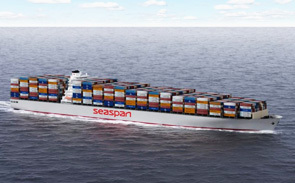 Cargo ships have grown by hundreds of CEUs dwarfing port capacities over the years. Will Anchorage someday dock these superships? Read the article at gCaptain here. 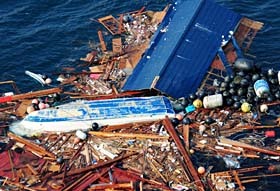 Check out Curtis Ebbesmeyer's Beachcomber's Alert for the definitive ETA on the Japanese tsunami debris. It's he - re! Then visit NOAA's debris site.